Indiana’s 168-page plan details how state officials will comply with the federal Every Student Succeeds Act, which replaced the No Child Left Behind law in 2015. As part of the guiding policy, Indiana schools Superintendent Jennifer McCormick pledged to close the student achievement gap in English and mathematics for special education students, students of color and other unique populations by 50 percent by 2023. States must receive approval of their plans from the U.S. Education Department to keep receiving hundreds of millions in federal funds. Indiana’s plan includes major goals for improving student success. That includes increasing the passing rates for black students in grades 3-8 from the current 45 percent to nearly 77 percent on the state standardized test for math and English. Part of the measure also includes a new A-to-F accountability system for schools. The new calculation would include how schools fair with chronic absenteeism and how well students learn English as a new language. Earlier this month the Indiana State Board of Education approved proposed changes to the A-to-F that do not align with the ESSA plan. A public comment is being held before changes are voted on again after April. 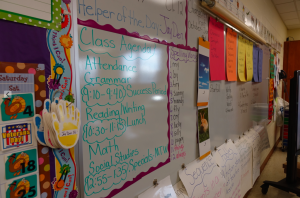 If the final policy is different than the blueprint already approved by DeVos, the state can request a change to the ESSA plan. Indiana’s ESSA plan also emphasizes evaluating a students’ readiness for college or career based on earning dual credit or an industry certification. The recent controversial approval of the “graduation pathways” set’s up a multitude of ways for students to earn a diploma by proving their readiness. Educators say ESSA allows more flexibility in standardized testing and school improvement compared to No Child Left Behind. In past years, Indiana had sought federal waivers from certain provisions of No Child Left Behind. McCormick’s department held nine meetings across the state in March and April last year to take in feedback on the plan. All states were required to submit a new education plan last year. As of Friday, the department approved ESSA plans from 35 states.